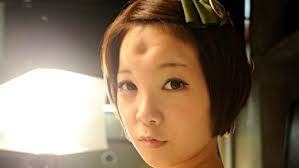 Bagel Foreheads Are the Scariest New Trend in Japan. This entry was posted in Life and tagged bagel, Bagel head, body modification, gross, Japan, trend. Bookmark the permalink. I think there are a lot more scary things than bagel heads. Freaky fashion statements from breast implants to botox injected lips are just as nutty as this new fad.